AdSense is the most widely used advertising program for bloggers around the world. The popularity of Google AdSense cannot be doubted. Millions of bloggers running this advertising program to make money through their blogs. Google AdSense also supports ads in android apps from the Play Store as well as in videos on YouTube. In this article I will specifically discuss Google AdSense for websites and blogs. There are many bloggers who want to be accepted by Google AdSense, but accepted by Google AdSense alone is not enough to succeed in making a lot of money because you still have to work hard to always create high quality articles in order to compete on the first page of google and get a lot of visitors. Not only that, your niche blog should also have a high click value and you also need to put ads in the right position to get a lot of ad clicks from your visitors. This article focuses specifically on how easy it is to install AdSense ads on WordPress blogs with the right plugin. WordPress platform users also need need to implement the right AdSense ad placement strategy. WP QUADS is one the simplest plugins to enable advertisments in any area you want. By optimizing your ad position, your ad revenue from Google AdSense will also increase. WP Quads is a WordPress Plugin and a replacement for the popular Quick AdSense plugin. Quick Adsense is used on more than 100.000 websites but has not been updated by the developer for years. The WP Quads plugin gives you the ability to easily advertise in various areas of your WordPress site. In addition, this plugin can also be used for a variety of other ads and is not just sticking to Google AdSense. With WP Quads, you can choose to insert your ads into specific positions or display them randomly in your content. You can even display unlimited ads per page. WP Quads also gives you the ability to use content tags to manually enable or disable certain ads or placements. The premium version of WP Quads plugin will give you more features like AMP support, more layout options, responsive ads, detection for ad blockers like Adblock plus and you will also get several new conditions, which allows you to enable or disable ads on certain devices or for certain types of post / role users. Supporting various devices, Responsive Ads). More than 60.000 site owners are satisfied with the advantages of this plugin. Here are the top 12 reasons why they believe in WP Quads. WP Quads Pro has a feature that enables you to activate Google AdSense ads on your WordPress blog when accessed in Accelerated Mobile Pages (AMP) version. So you do not need to worry about making your blog fast and you will still earn money from ads when you activate your blog for the AMP version. WP Quads Pro supports the appearance of ads on devices that have different screen sizes like mobile, tablet or desktop devices. There’s also a mode activation feature that will automatically detect the best ad sizes to display according to the screen size of the device from your visitors. WP Quads Pro gives you control to show and hide ads in accordance with the specs if your ad is showing on a mobile, tablet, or desktop device. And you can also hide & show ads on certain post types as well as special user roles. 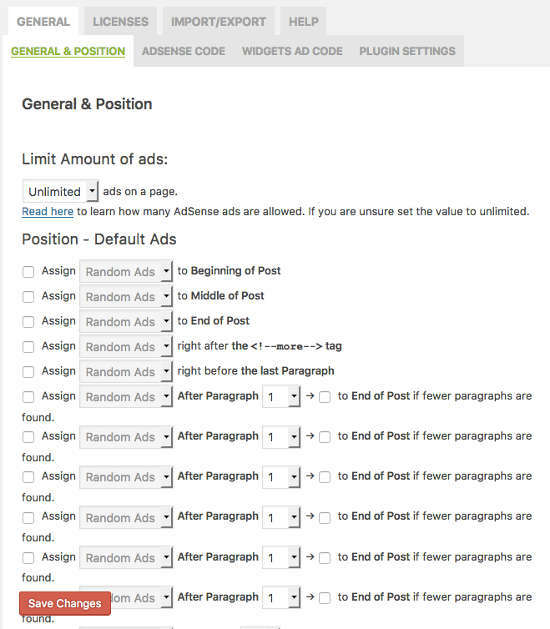 WP Quads Pro gives you the ability to create custom ad positions, with this you will be more flexible in creating new positions to your liking. WP Quads Pro also supports cache systems and popular cache plugins like WP Rocket, W3 Total and other Caching plugins. WP Quads Pro has a team of professionals in the field of Google AdSense optimization, this of course be its own advantages and useful for WP Quads users who want to ask something about Google AdSense. 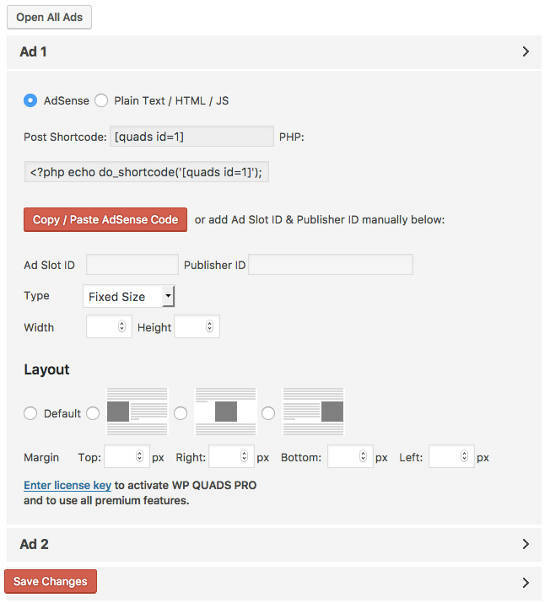 WP Quads Pro allows separate margin space for all four sides of the ad area (top, right, bottom, left), this will prevent your ads from being covered by the content. WP Quads Pro has an option to add a custom label like “Advertisement” at the top or below the ads you use, this is to inform your visitors that the shown content is an ad. WP Quads Pro is built with clean coding and is well developed so it loads quickly for a better user experience and search results so it will not burden your WordPress site. 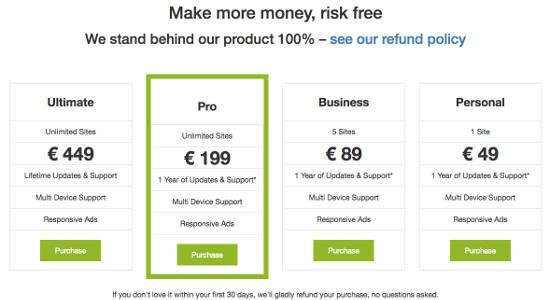 WP Quads Pro has an easy and simple look and settings, which makes it very easy to deliver good conversion ads to your audience. WP Quads Pro has the Adblock Detection feature. This is an important and cool feature you can get. So with this plugin you no longer need to buy a special plugin to detect ad blocker and would be more efficient for you. This adblock detection feature can tell if your visitors are using ad blockers and also have the ability to display customizable messages for adblock user visitors. It also integrates Google Analytics to measure the total number of visitors using ad blocker. 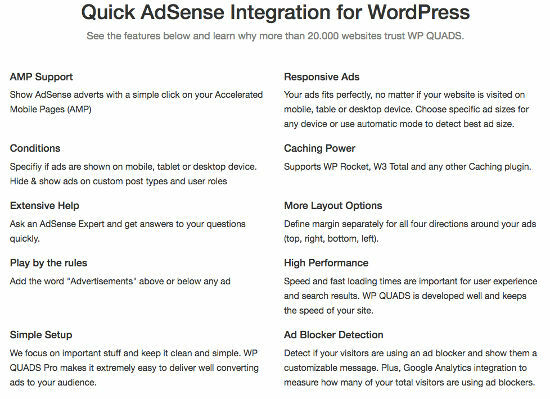 WP Quads Pro gives you the ability to add as many ads as possible to your WordPress site and No limitations are specified. WP QUADS free version provides content ad limit of 10 ads. Login to the admin area of ​​your WordPress site, and install the plugin WP Quads free version first. Click the Plugins menu »Add New and type in the keyword “WP Quads”. After that install and activate the plugin. Next install WP Quads Pro that you have bought and downloaded. Click Plugins »Add New» Upload Plugins , upload the WP Quads Pro plugin zip file from your computer and enable it. After both free and pro version plugins are activated, you will see a new menu named “WP Quads Pro” on your WordPress admin sidebar. 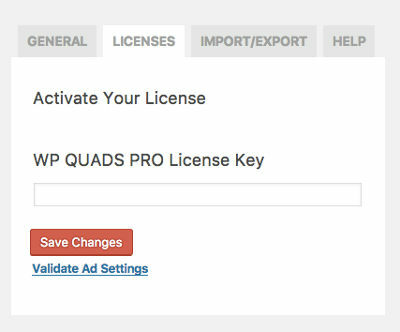 Activate the plugin with the license already sent to your email, or which you can get from your WP Quads account. Enter the plugin license in the “Licenses” tab menu in the fields provided. Click the “Save Changes” button. Next enter your Google AdSense code in the “AdSense Code” tab menu. In this section you have two options: AdSense (select this if you’re using AdSense ads) and Plain Text HTML and JS (choose this if you’re using ads other than AdSense). For this example I chose “AdSense” and click the Copy / Paste AdSense Code button. A popup will appear where you put your Google AdSense code. 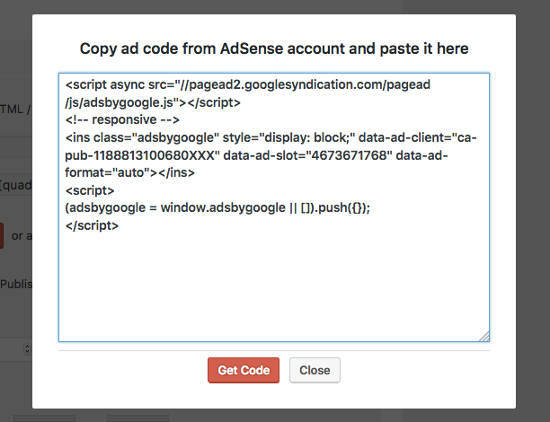 Paste your AdSense code and click “Get Code” button. In that section you can also adjust the position of ads in your content to Default, Right, Middle and Left. There is also a margin setting. Do not forget to click on the “Save Changes” button. The final step is to set the position of your ad. To do so go to the menu tab “General & Position”. In this section you will see lots of places that you can use to display your ads. Just enable the option “Assign” and select which ads you want to display or keep the default option “Random Ads”. Below this there is also a section for position and condition which determines if ads are displayed or hidden in accordance with the selected conditions. For example, you can hide AdSense ads for certain Tags or hide them completely on certain posts. You can learn more about the use of WP Quads by reading through the documentation » WP Quads Documentation .